“So then, my dear friends … work out your own salvation with fear and trembling. For it is God who is working in you, enabling you both to will and to act for His good purpose” (Phil. 2:12-13). Not gonna lie. It’s been a rough week. But I have gotten a lot done. Tonight is my last J-term class, all my work is finished, and I can look back with astonishment over how much I managed to do in such a short, intense time. At the beginning of the month, it looked impossible. Now it is finished. Yeah—I feel like celebrating, but there’s no rest for the weary. I have more work waiting on another project and a new class to begin next week. But, doggone it, for these few minutes I want to party. Remember my thoughts just a few weeks ago? I was making bricks without straw and bitterly complaining about it. But miraculously God saw me through. Straw came to me—I really didn’t have to scrape around too much. If I had known what He could already see, that it was going to go well and that I really would make it through (and learn good things in the process) then maybe I wouldn’t have wasted so much of the precious time I had whining and grumbling. Then again, maybe I would have. But, really, what good is whining? It feels great for a second or two—like the whistle on my teapot, a high pitched vent to let the steam out. But then what? Then I feel ashamed of my hissy fit. Why didn’t I trust Him more? Hasn’t He gotten me through every single one of the challenges I’ve had to face in the past? Has He ever just thrown up His hands and cried along with me, “Wow! This really is too hard!”? Nope. Not yet. Not ever. With Him, there is always a will and a way. But fear and trembling. I am full of both. Fear that what I face is impossible. That this time I really will fall flat on my face. Trembling with doubt that He won’t be there to catch me. This time could be different. This time might be IT. But, no! God is working in me—giving me the will to keep going, giving me the strength to do whatever is needed. All for His good purpose. All the time. And that purpose is for me and for others. And most of all it is for Him. Next Tuesday, my new class begins. There will be a new professor to meet, a new syllabus to discuss, new assignments to begin, and new doubts about my ability to do what is required—I’m certain there will be fear and trembling as usual. But I don’t want it to be business as usual. This time, please, may I do everything without grumbling and arguing, may I be blameless and pure, trusting Him to work in me and to guide me and even to enable me with a new will and better actions? May I be more about His good purpose than my own? I may—as I work and God works in me, both striving together for the same good thing. This party’s almost over. I have to get back to work, but I’m thankful for a moment of reflection and quiet celebration. (Insert a whispered “Woo Hoo!”) It is good to see what the Lord has done. Now may my foresight be as clear as my hindsight! “… I am glad and rejoice with all of you. In the same way you should also be glad and rejoice with me” (Phil. 2:17-18). Until then. “For which of you, wanting to build a tower, doesn’t first sit down and calculate the cost to see if he has enough to complete it? Otherwise, after he has laid the foundation and cannot finish it, all the onlookers will begin to make fun of him, saying, ‘This man started to build and wasn’t able to finish’” (Luke 14:28-30). I woke up this morning with a memory running through my head. It wasn’t just a dream, because it was something that had actually happened to me when I was around 13 or 14 years old. I have no idea what triggered the memory (maybe all of the snow that recently fell in Middle Tennessee), but I felt that the thought was there for a purpose. Was God trying to tell me something? Perhaps. From the time I was in kindergarten until the summer after the 10th grade, my family lived in Michigan, and, as a child, I enjoyed the winters as much as the summers. Naturally, much of the fun that we kids cooked up centered around the many lakes that were in the area. In the summer, we jumped off docks and floated in inner tubes while carp and blue gill nibbled at our toes. In the winter, we swept away the snow from the frozen surface to make bumpy ice rinks for figure skating, racing, and hockey. It was a blast, but it could also prove to be dangerous especially in the freezing or thawing stages. Was the ice thick enough? Was it still safe to go out and rescue forgotten items or would we have to sacrifice them as we watched from the shore while they disappeared in stages? I remember watching from my school bus window for a whole week as a shopping cart met its watery demise. Was it still there? Yes … until one day it was gone. However, my nature was not always so cool and calculating. One late winter day, as my friend, Lori, and I took a walk along the shore of the thawing lake, we saw something that kicked me into action without any thought at all. 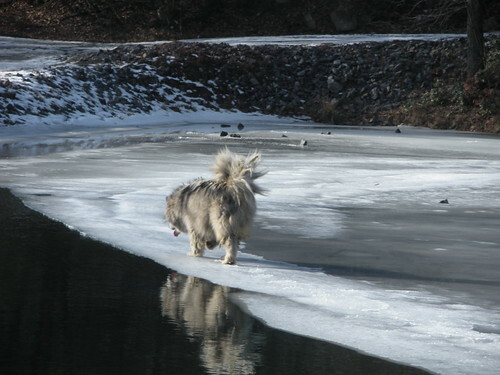 A large dog had fallen through the ice and was struggling with all he had to get out of the water. We called for him to come to us, but it became clear that he wasn’t going to make it. Without thinking and wearing a full length wool coat and boots, I ran out on the ice to save the poor dog. Of course, you can imagine what happened. In seconds, I also broke through the thinning ice and found myself in way over my head. I can still see my friend screaming on the shoreline as the dog and I bobbed in and out of the water breaking more and more ice until we finally made it to a place where we could touch the bottom of the lake. I still remember the heavy weight of my saturated coat as we made our way back to Lori’s house to call my mom, and I still feel the relief when I think of what logically should have happened. Did I learn my lesson? Yes and no. I don’t run out onto thin ice anymore—unless a dog is drowning. I do still have the same tendency to follow my passion without counting the cost. In some ways, I feel proud of that trait. Wasn’t it noble for me to rescue that poor dog? Didn’t everything turn out it the end? Well, that’s one way of looking at it; but, another way is that it would have been pretty stupid for me to die as a 13-year-old in order to save a dog. And how would it have affected my friend who witnessed my craziness? Or my family who would have lost me? Scenes from “A Wonderful Life” pass through my head as I ponder the whole thing. Yet, I am who I am. A woman who gets carried away by her emotions at times, and one who needs to be careful to count the cost of her actions. Others are affected by the things I do, and my actions matter. Jesus gave this warning to the crowds who were traveling with him. He knew that many who were in the crowd were thrill seekers driven by their emotions and only there to see the show. He knew that many would fall away as soon as the going got tough. So he gave them a challenge. “If anyone comes to Me and does not hate his own father and mother; wife and children, brothers and sisters—yes, and even his own life—he cannot be My disciple. Whoever does not bear his own cross and come after Me cannot be My disciple” (Luke 14:26-27). I love that Jesus didn’t tell the crowd to calm down and deny their emotions. He knew that passion was running high, and he didn’t squelch it. But what he did do was remind them that there would be consequences for the actions they took and that they should consider those before breaking through the ice. Count the cost. My life for a dog’s? No, logically that would be a poor exchange. My life for Jesus’ life in me? Oh yes. Definitely worth the plunge! “Thus says Pharaoh, ‘I will not give you straw. Go and get your straw yourselves wherever you can find it, but your work will not be reduced in the least’” (Exodus 5:10-11). “How do you respond when you are faced with a task that appears to be impossible?” I recently asked that question on my facebook wall, and the posts came fast and furiously. Apparently, I wasn’t the only one who had experienced this feeling. Many of my friends recommended a headlong dive into the pantry. Food seemed to be the number one source of comfort. Ice cream! Chocolate! Even spinach dip and chips! Oh yeah. I could relate to this reaction all too well, but with my focus being “disicipline” in 2011, I couldn’t let my heart or head go in that direction. Other friends took the spiritual high road reminding me that “all things are possible with God.” And while I had to acknowledge that this thought was beneficial—it is scripture after all—I wanted to protest that it simply wasn’t true in this case. Some things really were impossible! For example, I could never become a slim 20-year-old again no matter how hard I tried or willed it to be so. But that wasn’t the point, and I knew they were doing their best to encourage me no matter how much I wanted to snap back. After all, I’d used the very same words of encouragement many times myself. What was driving me to such despair, you ask? I am currently taking an accelerated course in my graduate studies program—an entire 3 credit hour class in one month—and I simply feel as though I don’t have what I need to accomplish successfully what is being required of me. 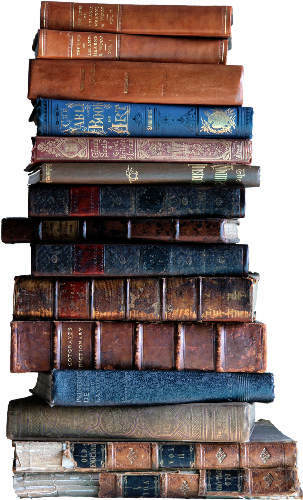 Because I attend an extension campus, I don’t have a library to supply all the necessary resources, and I don’t have the time or money to order the many books that could help me. Like the Israelites, I feel as though I am scurrying all over doing my best to gather stubble. But even with all of the physical tools, I don’t feel as though I have the mental know how to get the job done. And that is the part that is really driving me crazy! How can I make bricks without straw? How did the Israelites respond to their impossible task? They acted a lot like I am. First, they complained loudly! The foremen went to Pharaoh and said, “The fault is your own people.” After all, the Egyptians weren’t giving them what they needed. When this tactic failed, they turned to Moses and Aaron. Rather they turned on Moses and Aaron saying, “The Lord look on you and judge, because you have made us stink in the sight of Pharaoh and his servants.” Amen! I hate to stink at my work, too. Finally, Moses turned to the Lord. No, it wasn’t in a sweet and holy attitude of prayer. No, he didn’t piously declare that he knew that God could do all things. Instead he hollered, “God, why are you doing this to me?” Oh yes. Now there is a word I can relate to right now. Everything didn’t suddenly get better for the Israelites or for Moses either. In fact, things even got worse. But that didn’t change the fact that God was in control and that ultimately his promises would come true. Do I believe that God has put me in this course of study? Absolutely. I’ve already seen a lot of fruit and have felt his affirmation. Does that mean that I will do well in this particular class? Absolutely not. But I will get through it—either I will discover some way as yet unknown to accomplish my assignments or the calendar will graciously move me into February and a new class. One way or another, this too shall pass, and as my kids tell me, “C’s still get degrees.” To God be the glory! If I had to pick one word to describe my first week of the new year, it would have to be study. For those of you who are frequent readers, no, this does not mean that I am replacing my “Word for the Year.” I am still planning to focus my efforts around discipline. However, it does mean that I am discovering that study is going to be a huge part of that effort. On Tuesday, I began a fast and furious course in my MCS program at Union University that will require that I keep my nose in a book for the entire month—Bible Study for Preaching and Teaching. We will be looking at six approaches to Bible study and working on a project that will demonstrate each step. I can already see how helpful it is going to be and that it is only going to whet my appetite for more. But I have to keep moving in order to keep up with the accelerated pace of the J-term format. Then Wednesday brought the first two group meetings for the brave women of FBC Lebanon who have signed on to join me as we read the Bible through in a year. This fabulous opportunity also requires a great deal of study and preparation as God only knows what ideas we will bring together to discuss and study to rightly handle. And in both of these wonderful and stressful situations God is showing me the need to know and understand his word. The quick pace and my struggle to keep up highlights again that I need to be prepared to speak the truth whenever the opportunity arises. In order to do that I need to know what that truth is—and that requires lots of time invested in study. What was Paul’s advice to Timothy? How could he protect himself and his people from false teachings? By studying! By taking the time and making the best effort he could to learn God’s word. By knowing the truth, Timothy could recognize and refute a lie when he heard it. And that same advice applies to us today. More than ever, today’s believers are being bombarded by false teachings from all sides. Atheism, agnosticism, pantheism, New Age-ism, Oprah-ism (is that a word? ), and so on. How can we know what is true? By studying to show ourselves approved. Only then can we be strong and ready for whatever teaching comes our way. I’m thankful for my “study buddies” at church and at UU—strong men and women who are striving to know God’s word—and for the learning that will help me to arrive at a knowledge of the truth. Well … gotta go. Time to study.